How to make more of less-the book that shows how to simplify your life, control clutter, and pare down your possessions for a move into smaller living quarters. 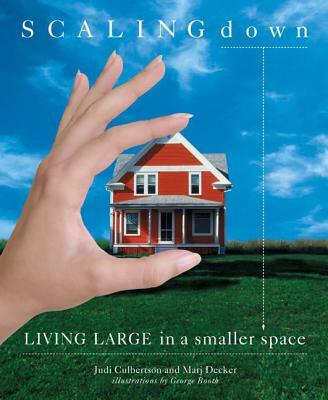 There are plenty of anti-clutter experts around ready to exhort us to sort, store, and trash our belongings, but this is the first book to address the specific needs of people moving from a larger to a smaller space, or merging two (or more) people's possessions into a single abode. If you and your mate are about to swap your large, single-family house for a condo, or move your parents out of the family home of 40 years into an assisted-living center, where do you start? How do you decide what to take, what to leave behind, and what to do with your discards? What can you do to keep the move from seeming tinged with loss? Scaling Down - by Judi Culbertson and Marj Decker, with Illustrations by George Booth - not only offers terrific nuts-and-bolts strategies for paring down one's belongings to only the best and most meaningful items, but it also addresses the emotional aspects of streamlining-the complicated relationship we have with our "stuff." Countering the pervasive American prejudice that having less is a step down, the authors advance their concept of "living large wherever you are "
JUDI CULBERTSON is a New York-based organizing/ decluttering expert who gives clutter-control seminars coast to coast. She is also the author of a decluttering newsletter, Traveling Light.MARJ DECKER is the CEO of the Denver-based company Time Is Priceless, which specializes in helping people downsize.